DPM, Inc. does it again! The PlantForm by DPM is another multiple use tool that your business can't live without. A large 7' x 5' work platform that can be used with skid loaders or forklifts, the PlantForm will move a large amount of material in a short amount of time. Literally a portable loading dock, the PlantForm can move and place containerized material and smaller B&B. 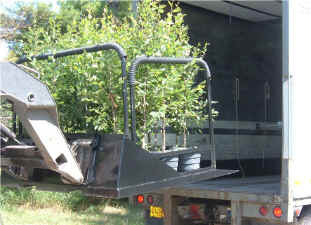 The PlantForm makes loading or unloading a truck a snap. "The PlantForm by DPM, Inc. is great for moving small to medium B&B and container material. We have been using them for several months and they have greatly improved our efficiency on moving larger material in quantity. They are also nice for unloading loads of mixed material: the same piece of equipment can easily handle anything on the truck. 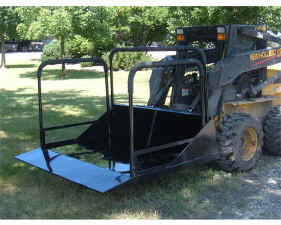 The PlantForm is another great product in the DPM line."